Feds Clear Banks To Do Business With Budding Pot Industry : The Two-Way The departments of Treasury and Justice signal that banks can work with the legal marijuana industry without fearing prosecution for such crimes as money laundering. 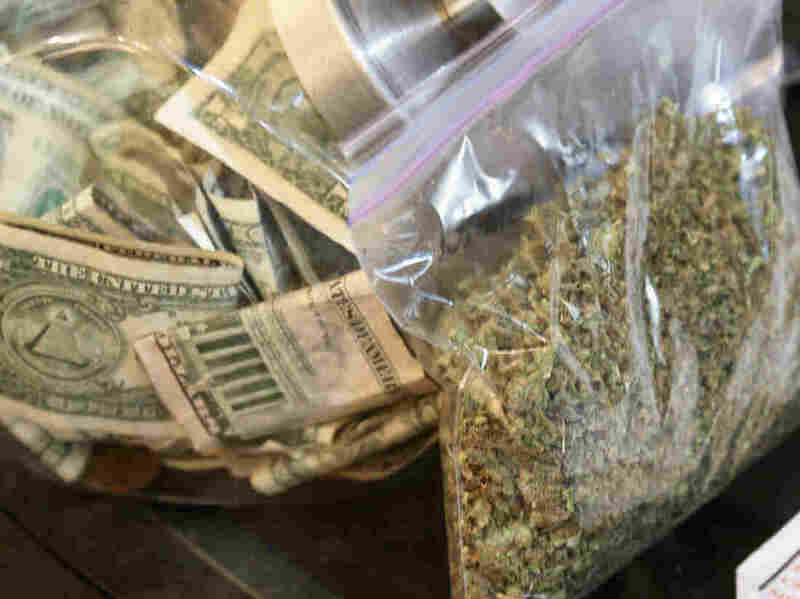 A bag of marijuana being prepared for sale sits next to a money jar at BotanaCare in Northglenn, Colorado, in this file photo taken on December 31, 2013. The federal government on Friday issued guidelines for banks seeking to do business with the legal marijuana industry, stopping short of a blanket immunity for them, but strongly indicating that prosecutions for such crimes as money laundering would be unlikely. NPR's Yuki Noguchi reports that the Department of Justice and Treasury Department on Friday sought to "clarify rules for banks trying to navigate the murky legal waters of the marijuana business. Murky, because pot is legal in a growing number of states, but remains illegal under federal law." "In the absence of specific federal guidance, most banks had kept marijuana businesses at arms' length, denying them loans, checking or savings accounts. [That] meant, like the street-drug trade, many state-sanctioned pot-sellers were doing cash-only trade," Yuki says. The banks have feared that federal regulators and law enforcement authorities would punish them for doing business even with state-licensed operations. "In a joint statement, the U.S. Department of Justice and the Financial Crimes Enforcement Network, a bureau of the U.S. Department of the Treasury, said the move gives 'greater financial transparency' to an industry that remains illegal in nearly every state." "It also makes clear that banks would be helping law enforcement with 'information that is particularly valuable' in filing regular reports that offer insights about how marijuana businesses work." '"Law enforcement will now have greater insight into marijuana business activity generally," FinCEN said in a news release, 'and will be able to focus on activity that presents high-priority concerns.'" Taylor West, deputy director of the National Cannabis Industry Association, calls the rules change a victory for her group's members. "They've had to do things like payroll entirely in cash," West tells NPR. "It creates huge security issues for the businesses, for their employees, and then it also makes it more difficult for them to handle the transparent accounting, which the industry is trying to put in as the standard." West says: "We don't expect every bank in the country to sign on, but we think there are a lot of banks that see that this is an industry that's projected to be worth two and a half billion dollars in 2014." Gabriel Spitzer of member station KPLU in Seattle reports that one of Washington state's most vocal advocates for reform of banking regulations related to the industry, is happy with the rules change. "It's a giant step forward in the effort by Washington State to stand up a well-regulated marijuana market," says Democrat Rep. Denny Heck.